The Warehouse Cafe is a vegetarian restaurant tucked away between Moor Street and the Bullring shopping centre. When we arrived we were settled into a lovely rustic table. 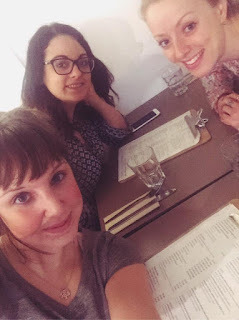 The owner of the restaurant came over and straight away asked if any of us had any allergens, which I loved because I couldn't have gluten or dairy and Becky is a vegan. We all ordered our drinks, obviously I had tea, and it came in this adorable little pot! The menu contained a large number of drinks, with a variety of different milks, soya, almond, oat and skimmed. The menu was also clearly marked with which allergens are included in the dishes and a lot of them could be adapted to make them either vegan or gluten free. I ordered the 'Warehouse Burger' which consists of a sunflower seed, butter bean, quinoa and spinach burger, topped with lettuce, tomato, caramelised onion and vegan cheese. The gluten free option meant it came in between 2 thick slices of gluten free bread and was served with wedges... How big are those wedges though?! Now I'm not actually a vegetarian but I have started to eat a lot of meat alternatives for both health and ethical reasons. I have massively cut down on the amount of meat I eat, limiting it to only be included in one meal per day, 5 times a week. The other two days include fish instead. But as I say, that's my personal reasons for doing that. But anyway, back to the burger... It tasted amazing, it was so tasty and it was nice to have a vegan cheese which had a bit of taste! The wedges were amazing, and despite how tasty they were I couldn't finish them! The best thing was left until last. On the menu there was a vegan cheesecake which was also gluten free!!!! In my 2 and a half years being gluten free I haven't had cheesecake, so this was just heaven! We did share it though because we'd eaten such a big meal, but I would happily go back to just have a cuppa and some more cheesecake! The cheesecake was a lemon and blueberry flavoured and wasn't overly sweet which was great. Overall, I would really recommend visiting the Warehouse Cafe, especially if you have any allergens, if your a vegan, or if your none of the above. The staff are so friendly, the food is made from good fresh ingredients and the setting is absolutely beautiful.